← King Josiah, Pattern for us? Admittedly, theology is particularly hard to boil into modern culture’s penchant for ‘sound bytes.’ Generally, they do not turn into sound theological bites. Recently, a church very close to the fellowship I help lead had some interesting material on their sign. I am new in this community and when he ran into me at the post office we had normal pleasantries before he asked about where I went to church. When I said that I lead the Messianic fellowship down the road he offered three very interesting observations. So when the two sides of his church sign had the posted statements, I couldn’t help but wonder if they were at least partly precipitated by our conversation. Taken individually, on face value, both of these statements are true, however, the implied underlying theology is errant. Particularly when, like two sides of the same coin, they are presented in tandem as the photo evidences. My hope is to have lunch and build a relationship with this pastor, so instead of assuming what he was implying, I want to zoom out to a broader focus of the church at large and the error they teach, nearly perfectly portrayed in these theological sound bytes. Therefore, all we need is Grace. 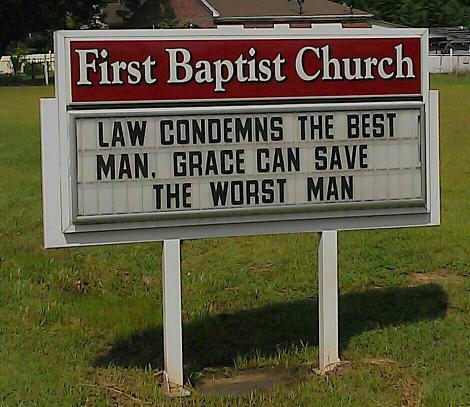 There can be NO GRACE where there is no Law. If the Torah is ‘done away with,’ then there is NO grace… No need for it. Rav Shaul (Paul) says, “Do we then nullify the Law through faith? May it never be! On the contrary, we establish the Law!” Breaking the Law is what puts us under condemnation/judgment and causes our need for grace. I John 3:4 says, “Everyone who practices sin also practices lawlessness; and sin is lawlessness.” Simply, Grace and Law are two sides of the same coin. They are inseparable. Moses and Yeshua (Jesus) were NOT enemies, nor did they teach anything differently!! Yeshua said, “For if you believed Moses, you would believe Me, for he wrote about Me. But if you do not believe his writings, how will you believe My words?” And He also said, “My doctrine is not mine, but His that sent Me.” And Moses, speaking the very words of Yahweh said, “I will raise up a prophet from among their countrymen like you, and I will put My words in his mouth, and he shall speak to them all that I command him. It shall come about that whoever will not listen to My words which he shall speak in My name, I Myself will require it of him.” What were ‘His words,’ the Words of Yahweh? Torah! (Remember, “I the Lord do not change”?) The church heretically thinks Yeshua taught something differently than the Words of Yahweh given to/by Moses. He couldn’t!!! Simply, the Law/Torah, stands. Grace is null and void without it. 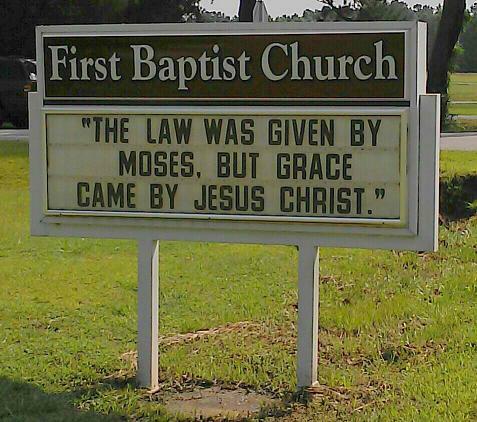 Further, Grace doesn’t free us from the Law, it frees us TO the Law. We are freed from past sin to walk in obedience TO the LAW! When we fail, we have Grace to pick up and again be obedient. We do not, by Grace, have license to be Lawless. A closing note, before I get fired up… LOL! I pray this post has challenged and encouraged you to look beyond ‘sound byte’ theology and dig into the Word of Yahweh!! This entry was posted in Deeper Study and tagged Apostle Paul, Christian, church signs, first baptist church, Hebrew Roots, Jesus, theology, Torah, Truth, Yahweh, Yeshua. Bookmark the permalink.